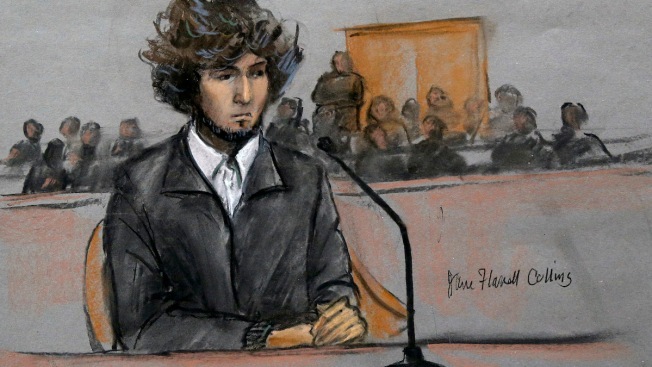 In this courtroom sketch, Boston Marathon bombing suspect Dzhokhar Tsarnaev is depicted sitting in federal court in Boston Thursday, Dec. 18, 2014, for a final hearing before his trial begun. A federal appeals court on Thursday agreed to hold a hearing on a bid by lawyers for Boston Marathon bombing suspect Dzhokhar Tsarnaev to move his trial outside Massachusetts. The 1st U.S. Circuit Court of Appeals scheduled the hearing for Feb. 19. Tsarnaev's lawyers have repeatedly argued that he cannot get a fair trial in Massachusetts because of the emotional impact the deadly 2013 attack had here. Three people were killed and more than 260 were injured when twin pressure-cooker bombs exploded near the marathon finish line. The appeals court rejected the defense request to suspend jury selection immediately, but agreed to hold a hearing on the defense request to order Judge George O'Toole Jr. to move the trial. O'Toole has rejected three change-of-venue motions and has insisted that an impartial jury can be found in Massachusetts. Last week, the judge said the jury selection process so far has successfully found people who have shown they can be fair and impartial. The appeals court rejected an earlier request from the defense to essentially take the decision on whether to move the trial out of O'Toole's hands. In its order Thursday, the court made it clear that only one judge out of the three-judge panel requested the hearing. Judge Juan Torruella wrote a brief opinion in which he said he believes jury selection should be suspended until both the defense and prosecution can make arguments at the hearing. The court's order said the argument may be granted at the request of a single judge. Torruella said he also disagrees with the appeals court's order to keep certain juror-related materials sealed from public view and to not discuss the sealed material during next week's hearing. "It will be quite an interesting hearing since the parties will be forbidden from discussing the details of facts directly at the heart of the issue presented: whether the answers given during the jury selection process have demonstrated that the jury pool is so tainted and prejudiced that it is impossible for the Defendant to receive a fair trial," Torruella wrote. Tsarnaev, 21, has pleaded not guilty to 30 federal charges in connection with the bombings. Seventeen of the charges carry the possibility of the death penalty. Tsarnaev is being charged under the federal death penalty law. Massachusetts abolished its state death penalty in 1984. On Thursday, the judge continued to question prospective jurors about whether they have already formed an opinion on Tsarnaev's guilt and about their attitudes on the death penalty. To be eligible to serve on a death penalty case, jurors must be willing to meaningfully consider both the death penalty and life in prison as possible punishments. Several people said they were strongly opposed to the death penalty and could never vote to sentence someone to death. One man, a retired banker and a veteran of the Vietnam era, said his son, a Marine, served three tours of duty in Iraq, where many of his friends were killed or maimed. "I think there's been too much killing during my lifetime, and I'm not prepared to participate in any more," he said. Another man, a physician's assistant, said he has spent his life trying to heal people and could never vote to sentence someone to death "under any circumstances." Another prospective juror, a teacher's aide for special-needs students, said she believes the death penalty should be used in heinous cases. There was an awkward moment when she said she would "be OK with the death penalty" in the case of Susan Smith, a South Carolina woman who was convicted of drowning her two young sons in 1994. Two of Tsarnaev's lawyers, David Bruck and Judy Clarke, represented Smith and persuaded a jury to sentence her to life in prison instead of giving her the death penalty. The woman said several of her co-workers have expressed strong opinions on what Tsarnaev's punishment should be. "They basically said, 'Fry him,'" she said. The woman said she respects the judicial process and believes she could be fair and impartial.